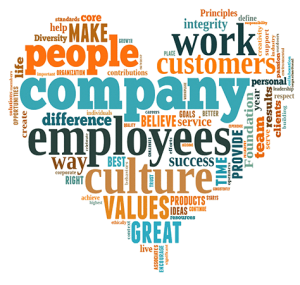 What is an organizational culture? By nature, a culture is supposed to be driven by a community and should be progressive. Now an organization’s culture should be able to do just that; and so the essential aspects are – leaders with their vision and goals; whether team-members are clear and aligned to them; and what is done about developing knowledge, skills and attitudes (KSA). This phenomena of an organizational culture is as difficult as simple it is to express it. Why? No prizes for guessing as a human mind continues to be the most complicated scheme of things! In my over 11 years of experience with Organizational Development, Talent Management and Learning & Development, I have come across so many different kinds of organizational cultures that I felt it’s time to reflect and share my experiences. 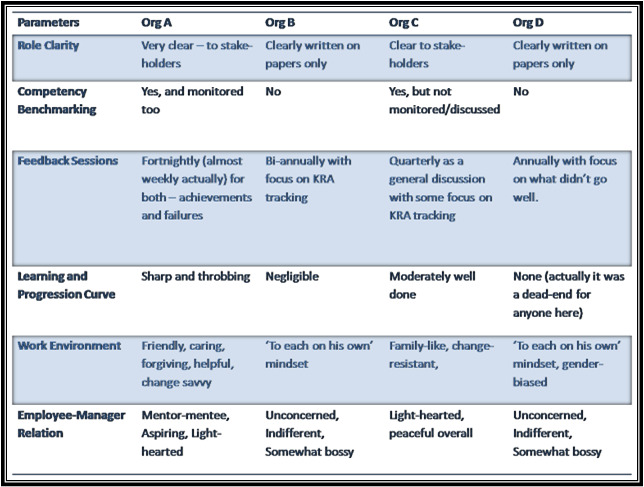 So while the table below reflects my overall experiences but this study too by Gallup has been useful – click here to read. The table above is more about established organizations with at least 1000 employees at one location and does not echo a culture of a start-up. Next post will be about culture at a start-up! It is really a delight to work with a culture like that of Org A because of the strong and able leadership which is sure of itself while it stays democratic. Learning and executing runs in the veins of the team-members; and cut- throat competition and gossips related to compensation and incentive schemes are alien stuff there! Would like to know more from you about your organization and whether you would like to change anything about it.